The CCGA 2002 Calendar is now on sale. The calendar features Coast Guard Auxiliary volunteers in action during the six regional and international Search and Rescue (SAR) Competitions held in 2001. 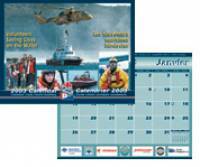 All proceeds from the sale of the calendar will go to the CCGA SAR and Boating Safety Programs.